Nokia invited some bloggers to a Q&A session with the Nokia Lumia 820 Project Managers, which allowed us to ask some burning questions about Nokia’s lower-end Windows Phone 8 handset. In attendance was Tuukka Jarvenpaa, Senior product Manager at Nokia and Camilla Lindman, also Senior Project Manager. The NL 820 supports 64 GB microSD cards. The battery needs to be removed to insert or replace the card. The screen is not Gorilla Glass, but is scratch resistant. The snap-on covers made the device both Uni-body, which is good, but also versatile, for example adding wireless charging or a rugged shell. Nokia is “looking at the possibilities” of a standby clock on the screen when the device is sleeping. The rugged case did allow Nokia to address different channels such as both consumer and business with the same device. Nokia did not comment whether future devices will also have wireless charging. Nokia may look into a rugged shell with wireless charging included. 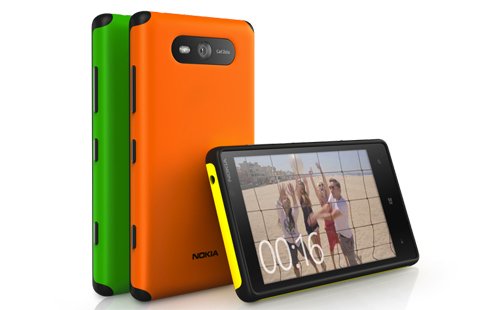 Nokia could not talk about delivery dates, pricing and availability yet. They were able to have better battery life on the NL 820 despite a smaller battery due toÂ the Snapdragon S4 engine with improved power management capabilities and also Nokia know-how & expertise on the power management. They hopes to leverage the fact that Qi wireless charging is an open standard, but could not comment on 3rd party plans. The NL 820 screen featured Nokia’s Â ClearBlack display and other Nokia specific features like Sunlight Readability Enhancement. While the Nokia Lumia 820 is not foremost in our minds, being vastly overshadowed by the Nokia Lumia 920, it is nice to see some thought has gone into the creation of the device, which should hopefully translate into a good experience for buyers and success in the market. Thanks Ben from Nokia Connect for the opportunity to attend the Q&A.